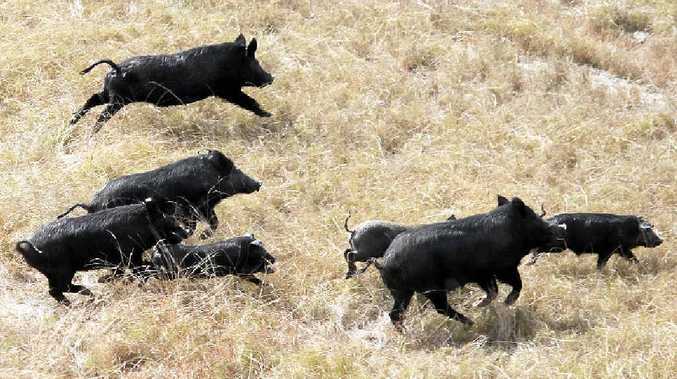 FERAL pigs are in plague proportions in the Gympie region and numbers are exploding at a compound rate of 150% a year, according to Gympie shooting advocate Ron Owen. Mr Owen says he has $10,000 worth of prizes so far and will have "more like $20,000" by October, when he hopes to have sporting shooters help do something about the feral pig plague. He says two worthwhile causes will benefit from the Queensland Big Boar Hunting Championships, to be held from October 23 to 26. The hunt will help eradicate a feral pig menace and will also raise money for Australian war veterans. "The hunt has two main objectives," Mr Owen said yesterday. "One is the removal of as many feral pigs as possible." Pigs, he says, damage local industries and the environment. All proceeds from the hunt will go to the Wandering Warriors veterans and their families. Mr Owen gives credit to the organising contribution of the SAS Queensland Association. He says the organisation organises Wandering Warriors as a charity initiative. "Its members are veterans of Australia's military conflicts over the past 50 years," he said. "They volunteer their time, energy and resources to conduct events which raise funds for veteran and family focussed charities. "Wandering Warriors has no paid positions and uses money it raises to help wounded veterans and their families." The other benefit is some sort of control over Australia's estimated 25 million feral pigs. Mr Owen says Queensland has about four to six million of those. Mr Owen wants to encourage about 600 entrants to get involved in the event, hunting with their choice or combination of firearms, bows or dog teams.